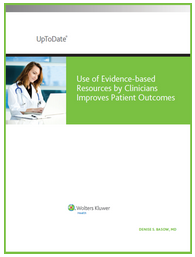 Click the cover of our FREE evidence-based medicine white paper to download it today! UpToDate contains more than 9,000 graded recommendations for care! "David Sackett defined evidence-based medicine as the judicious use of the best available evidence in the care of individual patients." Listen to Dr. David Rind, VP of Editorial and Evidence-based Medicine at UpToDate, talk about evidence-based medicine at UpToDate. © 2014 UpToDate, Inc. All rights reserved.